We are happy to introduce our latest AerOceaNetwork (AON) member office in Manila, Philippines. Contact : Emil Calangi – Managing Director. Topnatch Freight International Inc is a Filipino owned company, still young but manned by competent people with established individual track records in the industry. The company is building on trust, to meet client needs for a comprehensive, reliable and efficient custom brokerage as well as other forwarding services. They cater to personal effects (duty free), dutiable goods, trans shipment, warehousing and export on LCL / Break bulk or full container load on air or sea shipments. They also provide consultancy on tariff classification. They believe in providing value plus added service to its client. Although the company is barely 22 years old the management of operation has impeccable experience in the cargo handling industry. At, Topnatch Freight International, the client is first and foremost. They are primarily in the business of building relationships, aimed to be long lasting and service oriented. A touch of personalized service is a matter of company policy. Whether your cargo is a small bolt or large machinery’s for complete manufacturing line, via air or sea, call them for your customs brokerage and freight forwarding needs. 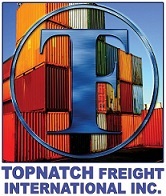 We welcome Topnatch Freight International Inc. to the AON team!